When you’re a new parent, there’s a good chance that you will find yourself on a pretty tight budget. That is normal for a variety of reasons, which are all different depending on your situation. But most new parents tighten their budget because they aren’t sure of the costs of raising a child for the first few years of their life. There are obviously a lot of essentials that you’ll have to buy, like food, diapers and other things. But you also have to think about some luxury products like baby video monitors. Some parents think it is an unnecessary luxury, while others find it to be an essential item in their home. No matter where you fall in the spectrum, you want to make sure that you get the best bang for your buck. We will tell you about the best baby video monitors under $100 that you can find, and offer some opinions as to why it is the best. It’s hard to find a video baby monitor with WiFi that’s less than $100. 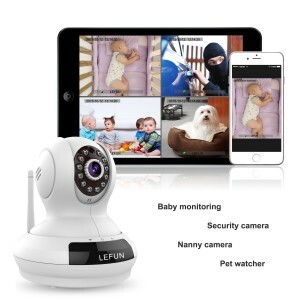 But that’s exactly what you have with the LeFun Wireless WiFi IP Surveillance Camera HD 720P Nanny Cam Video Recording Play/Plug Pan Tilt Remote Motion Detect Alert with Two-Way Audio and Infrared Night Vision. Since it can be accessed over any WiFi connection, you can keep an eye on your child on your smartphone or other device even if you are at the grocery store, at home or even out of town! What’s unique about this video baby monitor is that it functions as a surveillance camera, so you have more unique features than just a standard monitor. You have the ability to record and playback since it has an SD card in it. The camera can rotate 350-degrees horizontally and can tilt 100-degrees vertically. And you can control everything with your smartphone. There are a lot of features on this video baby monitor for the price being less than $100. It’s important to note that these features do work well, but your image quality may not be the best. When you have a lot of features in a product, nothing really stands out as exceptional, and this video baby monitor is no exception. Motorola is one of the household names when it comes to the technology industry. Usually when their name is on a product, that product is going to be pretty expensive. 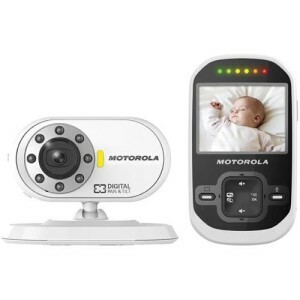 But you can get the Motorola MBP26 Wireless 2.4 GHz Video Baby Monitor with 2.4” Color LCD Screen, Infrared Night Vision and Remote Control Camera Pan and Tilt for less than $100. This is a pretty simple video baby monitor in terms of the features it offers. It only has a 2.4” LCD color screen, but the camera does have pan and tilt features to allow you to see more of the room. Other basic features include two-way communication, infrared night vision and the ability to pair up to four cameras with it. The screen is actually very clear, so the clarity makes up for the lack of size. Overall, this is a pretty good video baby monitor, considering it is under $100. It doesn’t have a lot of special features and functions, but it performs the basic functions of a video baby monitor very well most of the time. Is it Worth Spending Less than $100 on a Video Baby Monitor? You’ve probably always heard that you get what you pay for. When it comes to your child, it’s usually not a good thing to try to be cheap, unless your budget just can’t justify spending additional money. But the good thing about these two video baby monitors under $100 is that they are good quality and you know your child will be safe and secure when the camera is on them. You are going to miss out on some features that you would get with more expensive models, but when you’re on a budget, those are sacrifices that are usually acceptable to make. And since you aren’t spending that much money on these video baby monitors, you can try them out for a little while and always upgrade if you decide you need more features.